Not quite what I expected. I thought of a lesson on VHF and UHF radio propagation, while this is heavy on RADAR and light waves. 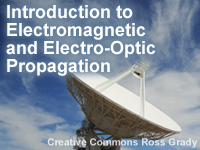 I selected this lesson because I wanted a better understanding of unusual radio propagation conditions such as tropospheric ducting. It was very helpful in this regard. I like the format. I like the small sections and steps. I didn't like that if I went full screen, I had to exit out of it to advance to the next section. Very good course for linking principles of EM radiation and propagation to remote sensing. I will recommend it to my students. Good course on EM propogation. This course is very thorough and informative with a logical layout. Its apparent that much time and thought went into the design and this is appreciated! tough module, great info, well presented but maths and physics is not a strong point! I found this course to be very detailed. It was fun to discover and to participate in this learning experience. While the use of formulas and some symbols can be unfamiliar to some, I feel that a little brushing up on some alphabets would be in order to clear away that disconnect. For example, anyone can find Greek and Latin alphabets online to use as a reference for pronunciation, spelling, and symbol in lower or upper case form. This may be important for people to follow along with the audio presentations in this course or other presentations within the MetEd and UCAR system. I am not the intended audience, in that I have no career background in weather, but the course is very relevant to me in the hobby of amateur radio. There are tidbits of information that I learned for the first time and hope to begin applying soon. I liked it, so I plan to return to read it again. I liked this class, it was interesting, well laid out and clearly written. A more detailed summary of the main points would have helped, but the graphics were good and it had a reasonable pace. Now I do have a strong background in this area--I've taught a couple of introductory physics classes, fly gliders, and got an FCC radar tech license. Those helped a lot. (I also passed the course on to the editor of a newsletter for fellow ham radio people working on VHF and above.) But that said I believe anyone with a reasonably strong interest in the topic and a decent introductory foundation in meteorology or the physical sciences can get through this course. It certainly is a good orientation to the topic. This may have been the hardest thing I have ever had to do in my life. When CBT spits mathamatical equations at me I tend to blank out. AG2 is correct this may be helpful for someone who is a "freakin scientist"
Describe how weather features affect refractivity and result in anomalous propagation, including trapping and ducting. Define super-, sub-, normal or trapping refractivity. Describe how refractivity results in normal or anomalous propagation. Given a vertical profile of refractivity, identify regions of super, sub, normal or trapping propagation. Describe Planck's law and its derivatives: Stephan-Boltzmann’s Law and Wien’s Displacement Law. Describe Lambert’s Cosine Law and Kirchoff’s Law and their implications for infrared radiation. Given the environment (aerosol and weather), describe the effects on EO propagation.